Christine Ferrouge’s show, Little Heroes, offers a spirit of hope in narrative portraits of costumed kids. 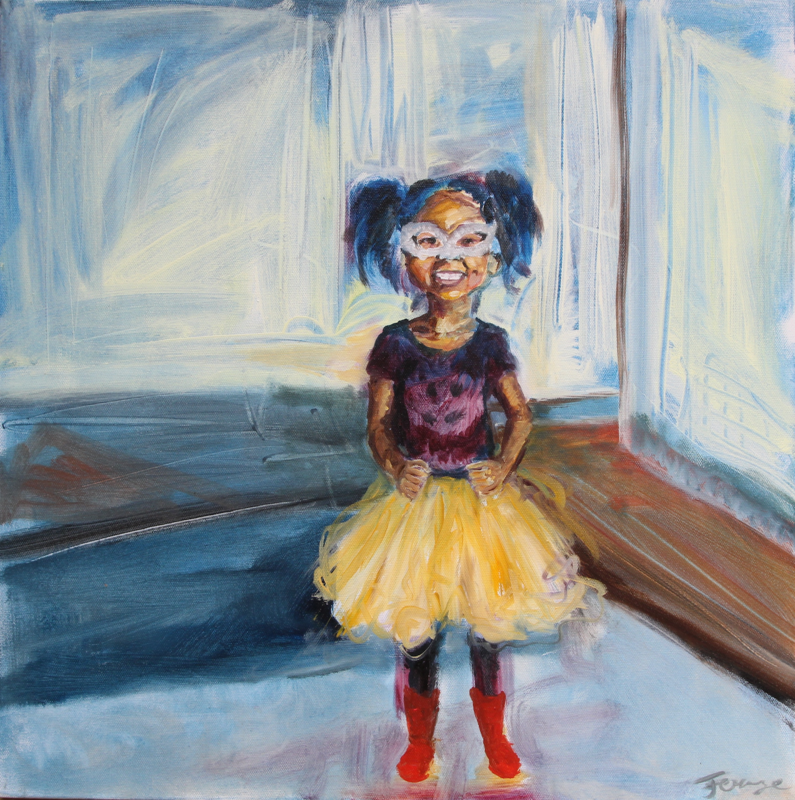 Ferrouge seeks positive role models and racial inclusivity for her three daughters in Oakland, California. 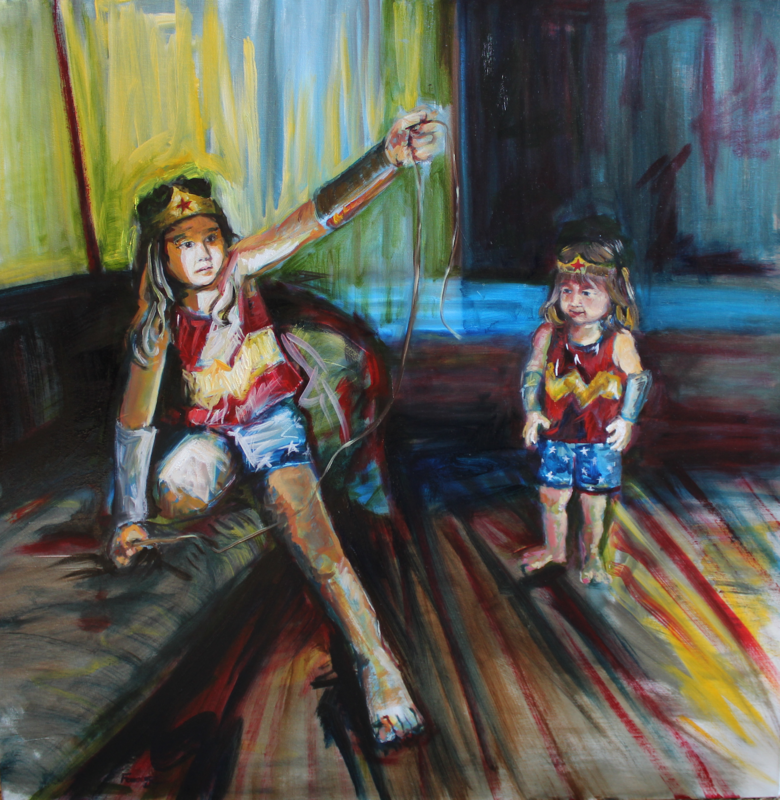 These paintings are a glimpse into some moments of their young lives. The girls, and their friends, have an inner strength and confidence that mirrors the courageous heroes who’s costumes they wear. 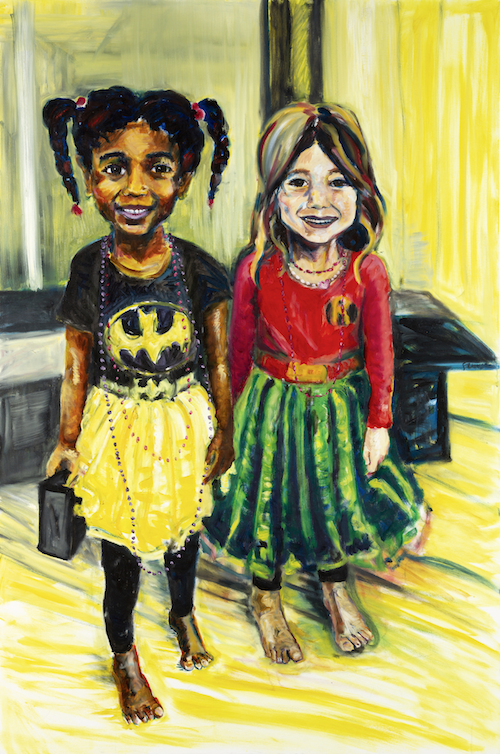 In Batgirl and Robin, her daughter and friend stand side by side, teaming together in strength and friendship. Ferrouge raises her girls to be empowered, express themselves, and be responsible. In Wonder Woman Is Making My Lunch, these tiny girls cook for themselves while wearing Wonder Woman and victorian costumes. It represents a commonplace scene in the artist’s home. My Sister is Amazing, explores the relationship between two sisters trying to figure out the Lasso of Truth during a dramatic make-believe afternoon. 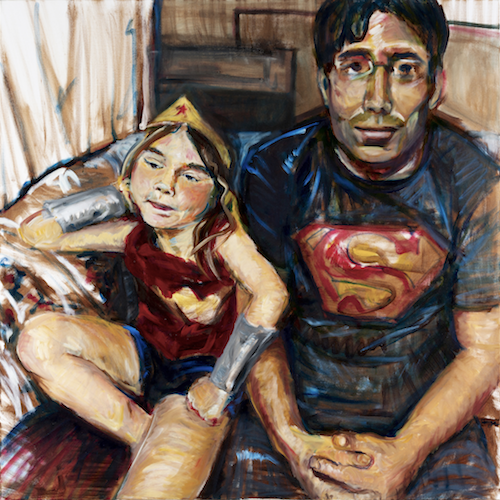 Daddy is content being a hero in Superman is my Sidekick, but the girl’s pride shines as she thinks about her power. Super Batgirl has that same spirit that exudes strength and joy. 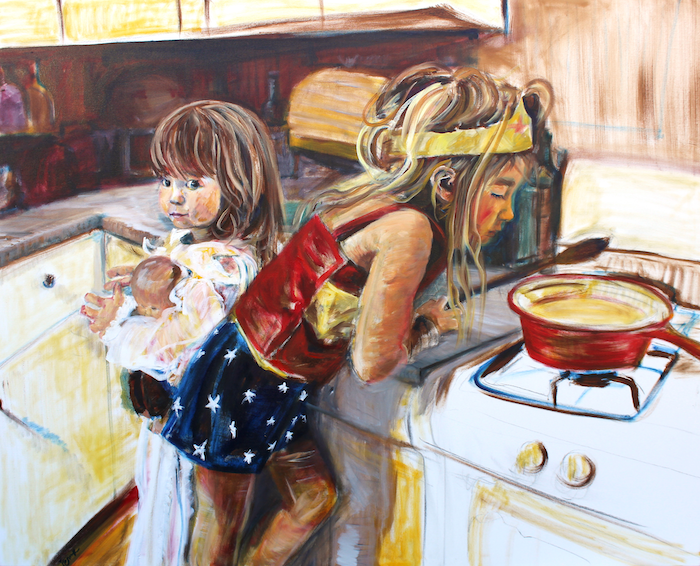 In most of her paintings, these towering girls are literally larger than life. Ferrouge insists that scale is integral to the work. If her little girl characters were standing in real life, many of them would look a 6 foot viewer in the eye. The artists’s use of color and gesture also contributes to the presence of the work. The canvases dance with lively strokes, bold gestures, and intense color. Ferrouge carefully uses traditional layers of painting at times, and contrast it with patches of raw canvas, striking an interesting balance that creates a commentary on oil painting itself. On view through November at the Werkshack.